War memorials and military cemeteries are familiar features of the European landscape, potent reminders of the days when Europe had an innate tendency to rend and tear itself. Those of the Great War of 1917 – 18 have never lost their power to evoke memories of past conflict and sacrifice. Military cemeteries all too often form an unforgettable feature of landscape between the Pas de Calais and Switzerland. They have an overwhelming visual impact, serving as portals to harsh reality and to emotions. The larger ones were memorably described by Rudyard Kipling as ‘Silent Cities’. On a smaller scale, bronze war memorials take forms that range from the abstract and classical to stern-faced generals and ordinary servicemen. As artefacts of remembrance their effect is likely to be more personal and concentrated than that of the great military cemeteries..
style characteristics of certain French, British, American and German cemeteries. 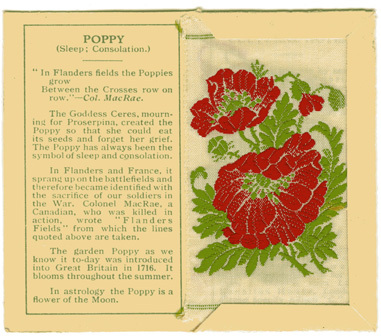 Poppy, the flower of remembrance. ‘Kensistas Flowers’ cigarette card (1933): woven on silk, set of 60 cards (J.Wix).